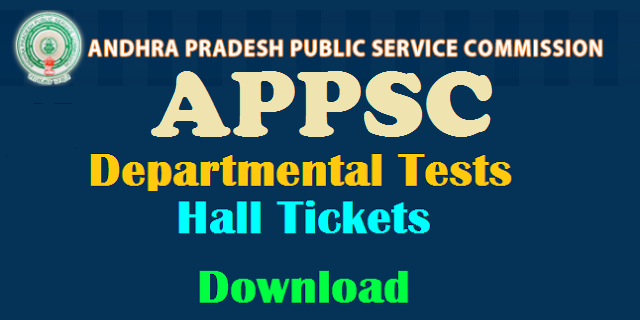 Andhra Pradesh State Public Service Commission (APPSC) released APPSC Departmental Test Hall Tickets, November- 2017 session to be held from 23.11.2017 to 28.11.2017 are hosted on Commission’s Website for downloading from 17/11/2017 till last day of Examinations. The candidate shall download the Hall Ticket along with the Guidelines and instructions to the Candidate and report One and half hour before the commencement of the Tests with proper ID proof in original for admission to the Tests. The departmental tests of Andhra Pradesh Public Service Commission will be held from November 23 to 28, according to an official release. The detailed notification can be read on this page or visit the website:www.psc.ap.gov.in. APPSC Departmental Tests, November-2017 Session Hall Tickets hosted on Commission’s Website from 17/11/2017. Candidates can download from Download Hall Tickets Tab from their logins.